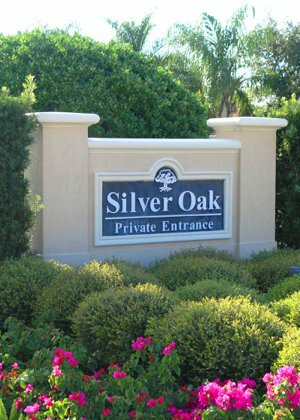 Silver Oak is one of the more prestigious guarded and gated communities located on Palmer Ranch in Sarasota. Approximately 270 homes were built on the 230-acre site between 1999 and 2007. Only the best area builders contributed their skills and craftsmanship to the community including Todd Johnston Homes, John Cannon Homes and Bamboo Development. Homes sizes are from 2,000 to over 5,500 square feet. Two sections of Silver Oak include a maintenance-free section along with a more traditional single-family home section. All homes are constructed using concrete block finished off with stucco. All roofs are tile. The streets are lit at night by gas street lamps. Homes are extremely well kept. The developers professionally designed the landscaping and the homeowners have kept it to the most exacting of standards with no expense spared. The opulent features became standard in Silver Oak and a partial list of what a homebuyer would find are open kitchens with a triple stove and matching marble counter tops throughout, high end appliances with names like Viking and Sub-Zero, walk-in pantries, wine coolers, , well-appointed wet bars. You can also find gas fireplaces, formal stepped ceilings, warm backlit crown moldings, 20x20 tile laid on the diagonal, huge towering sliders opening to a paver bricked lanai and summer kitchen. Relax with soothing music from the whole house entertainment system in a majestic master suite with a separate mirrored dressing room, double walk-in closets and grandiose whirlpool tubs. Lot premiums would include a lake or preserve view. Be sure to take a look at the Silver Oak HOA website for additional community information. If Silver Oak is on your list of places that fits your lifestyle, be sure to check out the recently sold listings and our real estate market report. This information will keep you informed with values and market activity any smart and successful buyer or seller of real estate needs to know. It is complete and full information, easy to read, and updated several times an hour. We are the local experts when it comes to Silver Oak and the Sarasota Real Estate market. John Woodward and his team welcome the opportunity to work with you and find that special place to call home.